Vegas hangover treatment bus: Is IV flush safe? OK, now it's official: Everything that happens in Vegas, stays in Vegas -- even your alcohol-infused headache and upchucking tummy. 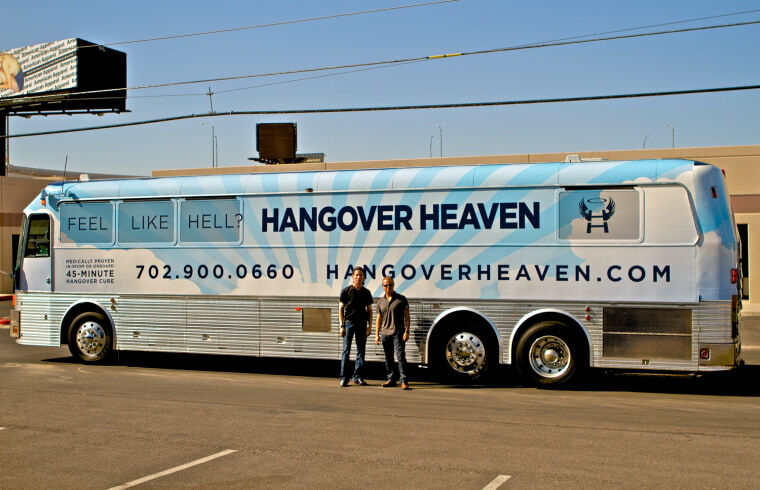 A mobile, hangover treatment center – a bus adorned with plush sofas, a well-coiffed doctor and special IV bags – is set to roll out Saturday, trolling the Las Vegas strip from 8 a.m. to 4 p.m., vowing to quickly flush last night’s fun overdose from your wilted body. Hangover Heaven is the brainchild of Dr. Jason Burke, a board-certified anesthesiologist who trained at Duke University and who –- if his venture pops the financial cork -- hopes soon to quit his day job as a hospital anesthetist. For $90 to as much as $200 (if you also choose his IV vitamin mix), Burke will pick you up, offer a cushy seat, plug an intravenous line into your vein and cleanse that post-party pain with a blend of fluids containing electrolytes and other solutions to cure dehydration, the anti-nausea drug Ondansetron, and the anti-inflammatory drug Ketorolac. The treatment takes about 45 minutes. “In the recovery room, I treat people who have nausea, aches and pains, disoriented feelings. I treat that all the time with intravenous anti-nausea medications, anti-inflammatories and IV fluids. And I thought: this would treat a hangover,” said Burke, who earned a medical diploma at the University of North Carolina in 1996, msnbc.com confirmed. Across the medical community, reaction to Burke’s enterprise is some smirks and concern about potential risks. But Newman cautions, "in the way that Jason’s using (these drugs) in Las Vegas, we don’t have any data that would say, in that environment, it would be safe or efficacious." Besides, hangovers are nature’s little wrist slap, added Michael Roy, executive director of Clearview Treatment Programs in Los Angeles. “It’s helpful for people to experience the negative effects of their drinking so they do not repeat excessive drinking episodes,” Roy said. Then there’s the damage alcohol can do to people with heart problems or other high-risk conditions, said Art Caplan, Ph.D, director the Center for Bioethics at the University of Pennsylvania. From his ethical vantage point, however, Caplan just doesn’t see how a physician can endorse – even tacitly – vacationers getting tanked. “I know this is Vegas, but, come on … Docs should not tell you to get blind, stinking drunk and then offer to wash you out,” Caplan said. Are doctors responsible for painkiller abuse?